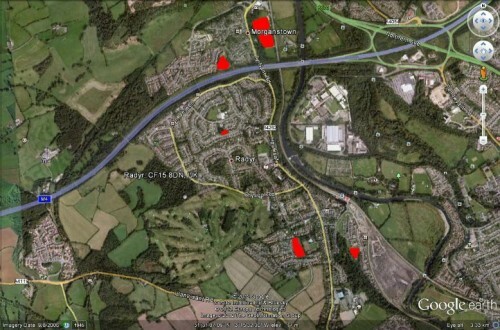 Play areas marked in red. Morganstown, Parc Radur and the Sidings. In addition play areas for children can be found at the Mound Field, Morganstown and Pentwyn. The Radyr and Morganstown Community Council published a local map in the summer of 2008. This map has now been made available on-line. As a PDF file you can zoom in to reveal all the detail on the original printed version. Printed copies may still be available from the Clerk to the Community Council. The RMA hope to be able to produce an updated map shortly (by Summer 2019) which includes details of the various areas with play equipment within the village and includes detail of the building developments completed since then.